It seems strange to name an album after a New Zealand Kiwi bird, but strange is a good thing in improvised music, where we expect the unexpected. And this electro-acoustic ensemble delivers, although not surprisingly, given the Creative Sources label's consistent catalog that features improvisation of the sensitive and close-listening variety. This is also apparently part of a series of albums using taxonomic Latin animal names and after some close listening the choice of a bird seems wholly appropriate. At 34:22, this is not a marathon session by any means but this long piece recorded live at the O'Culto da Ajuda, in Lisbon, Portugal in 2017 sounds and develops much like a symphony. The venue is devoted to experimental music and, judging by the results, the acoustics are conducive for this kind of slowly developing, dynamically wide-ranging improvisational compositional concept. Led by violist Ernesto Rodrigues, the 16-piece ensemble balances sounds by strings (violin, viola, cello, bass, guitar, zither, piano, psaltery), brass (euphonium, trumpet, trombone, trumpet), winds (oboe, flute, bass clarinet, alto saxophone), percussion and electronics via a laptop computer. The aesthetic here is of a slowly moving flock of sounds, coalescing in the ether, never one dominating and the whole being more than a sum of its parts. 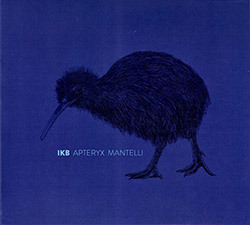 The music is shaped by the instrumental interactions, as the leading ideas and responses of members of the ensemble cohere and disperse in the air like bird sounds � hence the aptly titled album's reference to the Apteryx Mantelli, which Wikipedia tells us "has demonstrated a remarkable resilience: it has adapted to live on scrub-like farm land, pine plantations, and their native forests, but it still prefers dense, sub-tropical and temperate forest." This imagery is entirely relevant, as it seems this music evokes a sympathetic imaginative response for attentive listeners and the music that evolves over the 34:22 is like a living, sentient being.